The mark of a really good car is that when it comes to the driving experience, you don't have to give it much thought. As opposed to those cars that are a challenge to handle in everyday commuting simply because it takes a lot of effort to interact with the vehicle control systems. 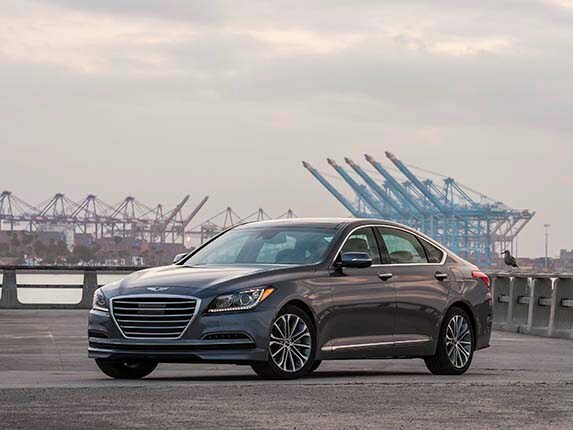 Our long-term 2015 Hyundai Genesis falls into the former category-it's a car you just don't have to think about when you're behind the wheel. It's that intuitive. This rear-drive sedan has great balance and while the Korean automaker offers a 420-horsepower 5.0-liter V8, we haven't felt that we've sacrificed any drivability by opting for the smooth and powerful 311-horse 3.8-liter V6. It's backed by a seamless shifting 8-speed automatic transmission. Slide behind the seat, punch the engine start button and use a traditional gear shift lever into drive and go-there's no push button transmission or small stalk-mounted lever, just a straightforward layout that has worked well for so many manufacturers for a very long time. The latest generation of Genesis pays particular attention to dynamics, with steering that has a bit more edge than the previous model which felt a bit vague on center. Whether in normal or sport mode, the steering action is smooth and linear with good feedback. Both the throttle and the brakes also have a solid linear feel to their application. Visibility from the driver's seat is good and the blind spot warnings in the mirrors are easy to pick-up and subtle in their display-especially the blind spot warnings which turn from amber to red if you actuate in the turn signal and you get a slight warning shake through the steering wheel in lieu of some loud audio signal. The head up display also works quite well and picks up speed limits which are shown in your line of sight. The best way to describe the Genesis' character is that there is a sense of calm to the way the car performs and reacts in everyday driving situations. That you don't have to think about the way things work is one of the car's strong points. The controls are straightforward, the rotary knob to handle functions displayed on the center screen is simple to use and the redundant switches in the steering wheel allow a number of different options when it comes to doing everything from changing a radio station or volume to toggling through the various menus on the instrument panel.